Bread is one of my favorite things–from the yeasty smell while it’s doing that last rise before going into the oven, while it’s baking, or just out of the oven while I’m waiting for it to cool a bit–to the crusty crunch of biting into a slice fresh from the oven. I’m addicted to having fresh bread when I want it, using the no-knead approach from Artisan Bread in Five Minutes a Day. I’ve had great luck with every recipe that I’ve tried from this book–from the basic white bread to the brioche, including pita bread, rye bread, and now the oat flour sandwich loaf. The stated intent of the oat flour recipe was to sneak more fiber and whole grain into the kids diet. Since I don’t have to worry about the kid’s diet, only my own, I decided that I wanted more oat flavor and a different consistency–more like free-form boule or a loaf baked in an Italian pan. I started with the “Oat Flour Bread” (pp.104-105) recipe in Artisan Bread in Five Minutes a Day” , then added the information gleaned from reading Healthy Bread in Five Minutes a Day on gluten requirements and characteristics of flours, I’ve been working on modifying the recipe to meet my particular desires: first, more oat flavor, and second, a dough that can be baked free-form, or in an Italian perforated pan rather than a loaf pan. Measure out and whisk together the dry ingredients (except for salt and yeast). When you’re adding vital gluten you need to be sure it’s well mixed with the flour before you add liquid or it can form lumps. Combine lukewarm water, salt and yeast in the mixing bowl and gradually add the dry ingredients. If you’re using a stand mixer, use the paddle instead of the dough hook. Place in a covered, but not air-tight container, and allow to rise until doubled in volume; then refrigerate. Pull of the amount of dough needed and shape as directed, and bake in an oven preheated to 400 ° F for about 45 minutes to 1 hour. 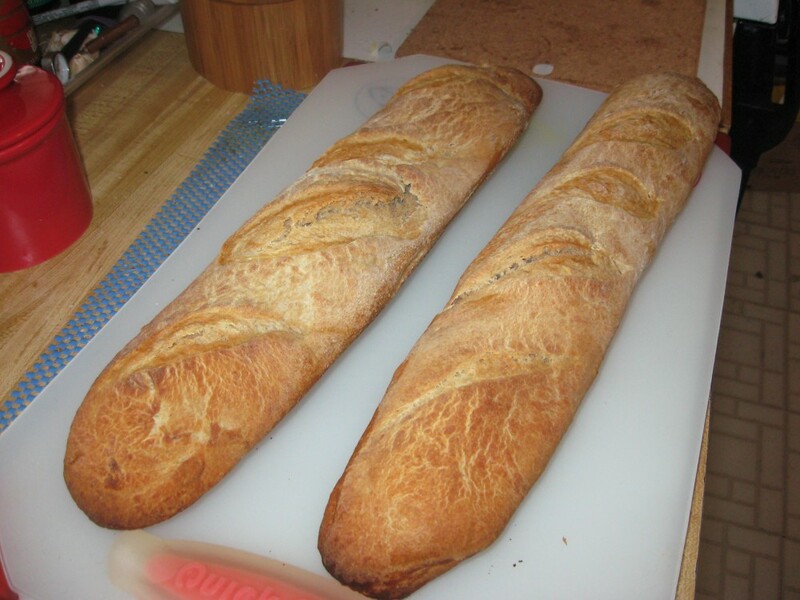 I like to bake my bread in an Italian loaf pan (bigger than a baguette pan), since it’s just the right diameter to slice the bread on a diagonal and have a good size for a small sandwich. For me this is an effort at mindful eating and portion control–rather than “dieting”. This would do well in a baguette pan for good crusty bread if you don’t want to use it for sandwiches. 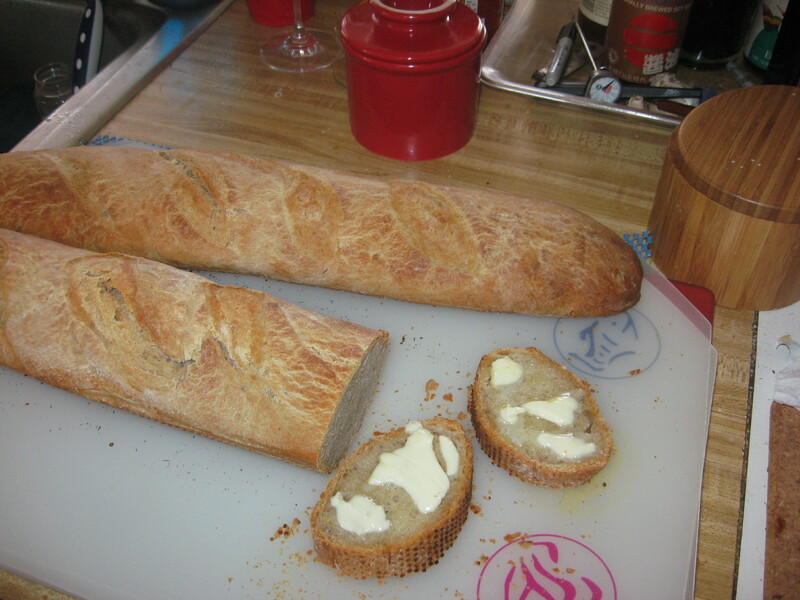 The Italian pan gives with some of the good parts of a baguette when it’s fresh out of the oven, but the flexibility to have sandwiches later as well. Thanks for your post! I can’t say that I make many cupcakes–I might like them a lot better if I made them myself. I guess I’m more into bread when it comes to baking. But cupcakes are certainly more suited to single-serving cooking than cakes. Oh yum. I’m drooling already. Looks delicious! Thank you! I’ve had a lovely afternoon having my fresh oat bread with some lovely, perfectly ripe Camembert, and, of course, a glass of red wine. I was just reading your post on “Munching Books”–that’s the way I like to read. I want some literature with my recipes, too.